After my grandmother passed, it was almost too painful to quilt so I tried distracting myself by running around with girlfriends and entertaining nearly nightly. I bought a new vehicle and never stayed home. For years my family and I wanted to leave Houston. We wanted a slower paced life for our teenage son so Bob found a job in Crockett, TX. We packed up and moved. The transition to small-town life was an eye-opener. I knew no one and discovered there was little to do. I dug out my fabric and began piecing again; this time on my old friend, my vintage Kenmore machine. This is the quilt that resulted. 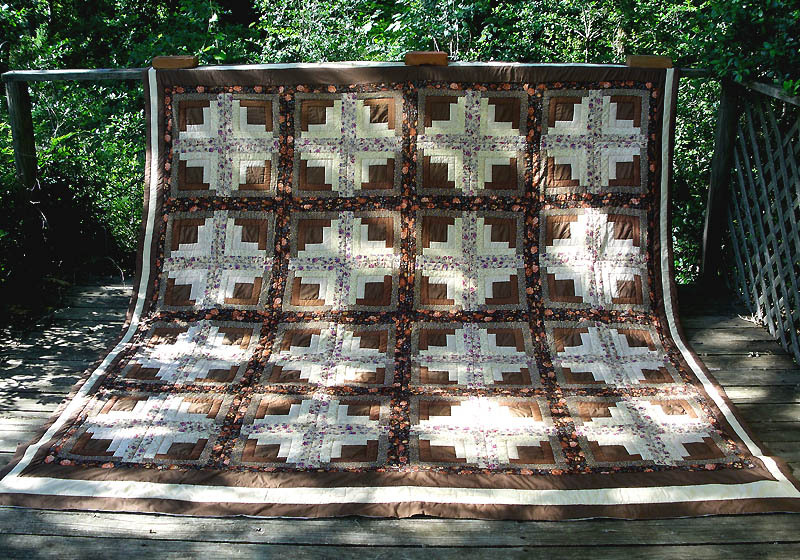 This is a machine pieced, hand quilted Log Cabin. I’ve used it for many years on my own bed… it’s lovely with my furniture and decor. It has a triple solid fabric border wider at the head and foot than at the sides. It was hand quilted in the ditch throughout with ecru thread on an ecru sheet backing. It is queen-plus size.